Google has a platoon of colorful bikes for its employees to use to traverse the sprawling campus. But recently the bikes have been turning up in an unusual spot: Stevens Creek. The Mountain View-based tech giant has admitted that a growing number of its bikes are going missing. In the past, one or two would go missing every few months. 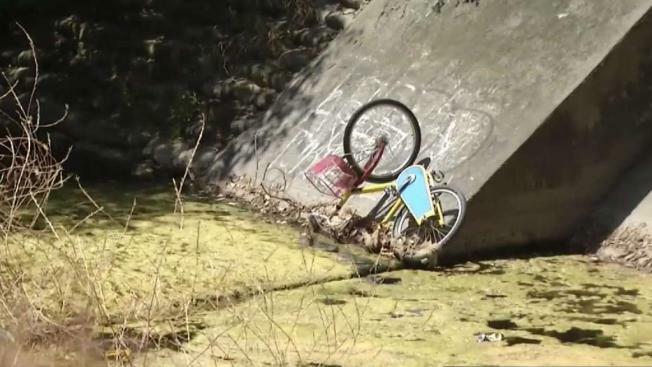 Now, however, a local group says it has found more than a dozen bikes in the South Bay creek in less than two weeks. “I pulled out six bikes Saturday and put them by the trail so Google could get access to them. I went back the next day and three of them had been thrown back down into the creek,” said Aaron Grossman of Friends of Stevens Creek Trail, a Cupertino community group that has been taking care of the waterway since the early 1990s. A woman, who asked to not be identified, said she too has noticed a jump in the number of bikes ditched along Stevens Creek. Like her, Grossman has been calling Google often. He helps coordinate picking up the bikes after they have been fished out of the water. Google wouldn't specify how many of its 1,000 or so bikes are missing. "It's really sad because it's bad for the bikes, it's bad for the creek," said Grossman.